Norway Spruce; Healthy but Ugly! Can it be shaped? We recently acquired a bungalow on the south coast of England (Lymington, Hampshire) and with it a number of trees which, I'm happy to report and healthy and beautiful! 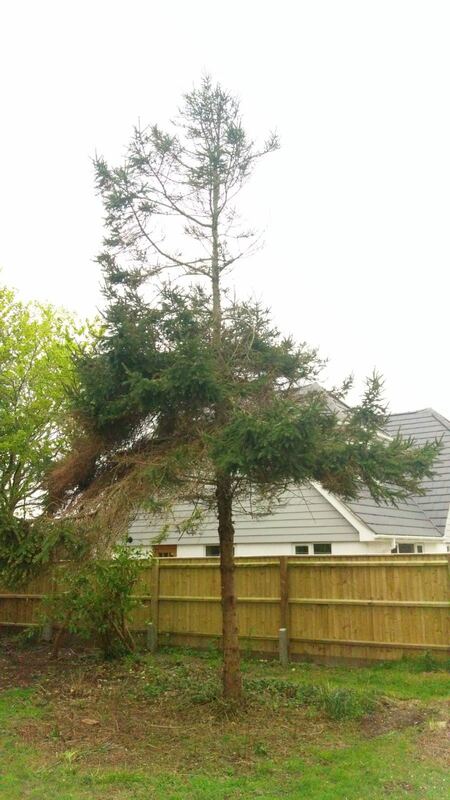 There is one tree, however, which, despite being in the rudest of health, is a real eyesore: a ~30ft Norway Spruce. Pics here or at inline the bottom of post. After removing a throng of brambles that were choking much of the lower half of the tree and making their way into the upper branches, we found that many of the lower branches were completely dead and, for better or worse, we cut these back to the trunk. I don't love the tree, but it has an interesting back story (previous owner planted thier Christmas tree when they were 5 years old) and I like the alpine aestetic it brings to the garden, in a corner that will soon be occupied by a scandinavian-esque cabin. I'm also generally reluctant to remove anything mature from the garden, really. Some research leads me to understand that I should avoid topping the tree, as it will likely loose it's "pointy" shape, amongst other issues associated with topping. I've also seen a number of tutorials on structural pruning, but all of these have focussed on smaller (literally christmas tree sized) plants, and are aimed at maintaining proportions in in already attractive tree. My question is: is there anything I can do to make this tree worth keeping, or should I just cut my losses and take it down? Edited 1 time(s). Last edit at 06/05/2018 08:08 by hypnoboutique.